Lyric Stage Company of Boston Begins 38th Season With "Big River"
Lyric Stage Company of Boston's 38th season will begin with a production of the musical "Big River." 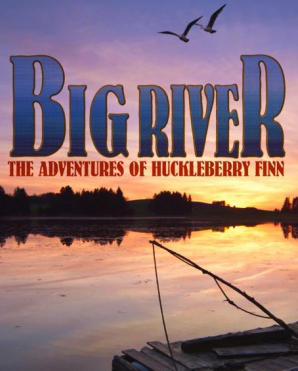 Based on The Adventures of Huckleberry Finn by Mark Twain, the production has music and lyrics by Roger Miller with a book by William Hauptman. Directed by Lyric's Producing Artistic Director Spiro Veloudos, performances are set for September 2 – October 8. The original Broadway production, opening in April of 1985, won eight Tony Awards including Best Musical, Best Book, and Best Score. Roger Miller, best known for his country-pop hits ("King of the Road"), deftly fused a charming, blue-grass tinged sensibility with Twain's timeless story. Set in the 1840's, the story follows Huck Finn as he escapes from his drunken father and meets up with Jim, a runaway slave. The story of their journey downstream is an American classic capturing the idyllic pleasures and unacknowledged injustices of life on the big river. The production at Lyric features Jordan Ahnquist as Huckleberry Finn, De’Lon Grant as Jim and Phil Tayler as Tom Sawyer, along with Maureen Keiller, Leigh Barrett, Erica Spyres, Peter A. Carey, J.T. Turner, Paul D. Farwell, Alycia Sacco and Kami Rushell Smith. For tickets and information, stop by the Lyric box office at 140 Clarendon Street, call 617-585-5678 or visit www.lyricstage.com.